Today thanks to advanced technology, you just need a scanning tool to identify car problems. Using the FOXWELL NT630 Plus scanning tool it’s possible to pinpoint the exact issue on your car. FOXWELL NT630 PLUS is rated among the best car scanning tools on the market. This is because it has some outstanding features that form the ingredients for the type of OBD2 scanner that most motorists and car owners look for. The FOXWELL NT630 PLUS is a comprehensive vehicle diagnostic tool. It works on checking the engine light, the ABS, body control module, steering wheel, and the navigation system. The indispensable scanning tool works on diagnosing your SRS system to ensure that it’s operating smoothly. Knowing that a working SRS system could be what stands between you and serious injuries when faced with an accident. Then you must make sure that your SRS system meets no hitches. The FOXWELL NT630 Plus will help you do this effortlessly. Besides, FOXWELL NT630 Plus uses the updatable software. With a free lifetime update, you can be sure you will get the latest software to make the device even more effective and compatible with newer car models. All you need is access to a good internet, and you will be good to diagnose your SRS system. Unfortunately, there have been some reports from users claiming that the functions are slow. This is a setback on the quality of FOXWELL NT630 Plus. The OBD2 diagnostic scanner is very easy to use and quite responsive. You will have a field day with the easy to understand and quick access controls. The well-arranged interface works on making it even friendlier to use. Due to its clarity, you are accorded an opportunity of rolling your shirts and taking care of some of the problems all by yourself. This not only saves you some bucks but also saves you on time spent in car repair shops. The incredibly laid out menu, keypad, and impressive colour display make it extremely easy to handle even for beginners. Better yet, FOXWELL NT630 Plus is very portable. This means that you never have to leave it behind when you are traveling. You will always be ready to diagnose your car despite your location. You will not get much help from the user’s instructions. Despite this, it is not too hard to find your way around the menu and controls of the scanning tool. A little research on its usage will come in handy. 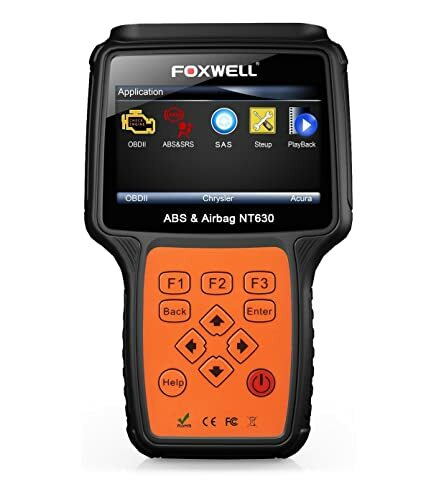 FOXWELL NT630 Plus diagnostic tool will help you in check engine light promptly and efficiently. It comes with extra unique and high tech features all designed to help you maintain and enhance the performance of your car in a top-notch condition. It will test the airbag and antilock system as well as help you read and reset codes. The gadget supports the user in turning off airbag/ABS indicators that can be quiet annoying and worrying. Naturally, it will automatically identify the car you are testing, provide live data, store and replay the data as well as turn off MIL. Despite the fact that the device works well it’s a bit limited on the make and models of cars that it can access. For one it does not support most diesel-run vehicles. One of the most incredible features that put the FOXWELL NT630 Plus over the edge is its ability to charge directly from the OBD2 display interface on your car. The fact that the diagnostic scanner does not need an extra battery to run makes it convenient for DIY users and whimsical travelers. Moreover, with NT630 checking on the electric components in your vehicles, such as the sensors, switches, and actuators is a fast and straightforward task. Apart from the non-battery charge, FOXWELL NT630 Plus is constructed using quality material that resists damage and impact. You can thus use it freely even in the toughest working areas and still be sure that your investment is safe and durable. It is not compatible with all car models, so you need to test the scanner before using it. FOXWELL NT630 PLUS comes with Diagnostic Cable, Blow molding case and User’s Guide. Reads and clear codes and turns off SRS light on a coloured display. It provides live vehicle data from the vehicle sensors. Allows you to look at two graphs from different parameters. Free software update for life. Compatible with most car models. Though not compatible with all car modes, it is still compatible with a wide variety of car models as it is able to scan 52 makes and models. It has full OBD1 and OBD2 functions. It works on both old models dating as back as 19996 and newer vehicles as recent as 2017. Covers a wide range of vehicles. Covers wide range of vehicles. Used on a large number of vehicle models. Amazingly the FOXWELL NT630 Plus tool is both economical and easy to use. Its compact and portable makes it a much-needed companion in your car. It is built for both DIY users and professional use. Its comprehensive features will ensure that you never have to worry about diagnosing car problems ever again. 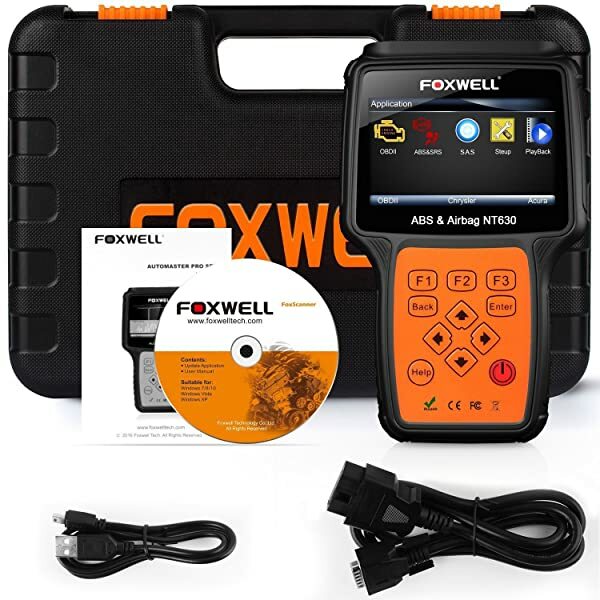 Due to the sleek model of the FOXWELL NT630 Plus scanning tool, one would be tempted to think that it has very little to offer regarding diagnostic features. But that is not so. The diagnostic device is more than capable of reading and erasing any error codes that appear in your vehicle. Besides this, it can be used on a wide pool of car models, and it can support all OBD2 test modes. Its accuracy in readings makes it a treasured possession.